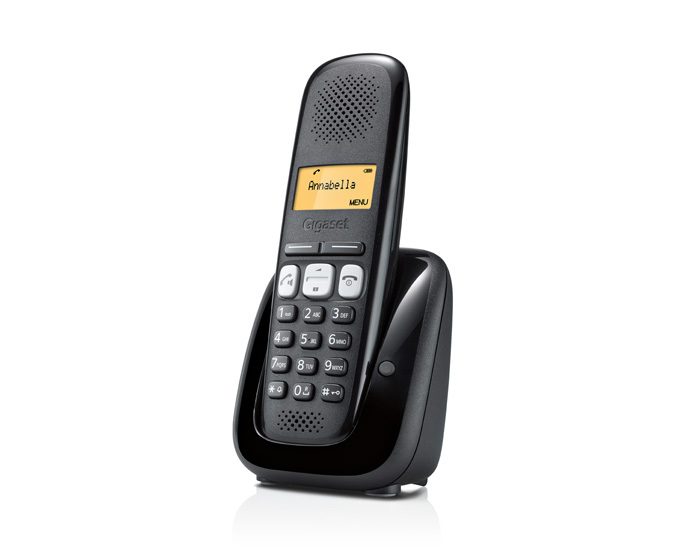 Gigaset A250: Enjoy calling that is straightforward and offers handsfree freedom with the basic, reliable Gigaset A250. For a great-value phone with reliable functions and handsfree capability, discover the Gigaset A250. 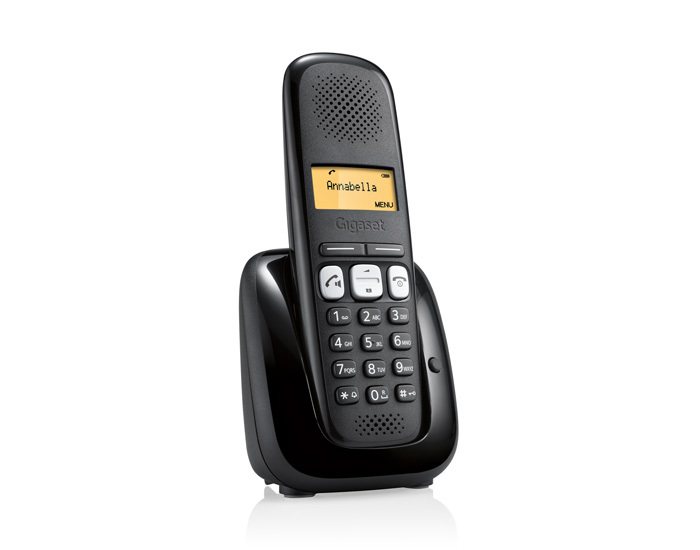 This cordless phone is enjoyable to handle, thanks to its user-friendly keys with sensitive pressure points. You can easily talk and multitask: simply press the illuminated handsfree key to begin talking via speakerphone. Setup is quick and easy with plug & play. The phone is pre-registered to the base station, making the Gigaset A250 ready to use straight out of the box. It offers 10 different polyphonic ringtones. You can also rest assured that the Gigaset A250 is an environmentally friendly choice in telephony, as it is equipped with Eco Mode Plus. 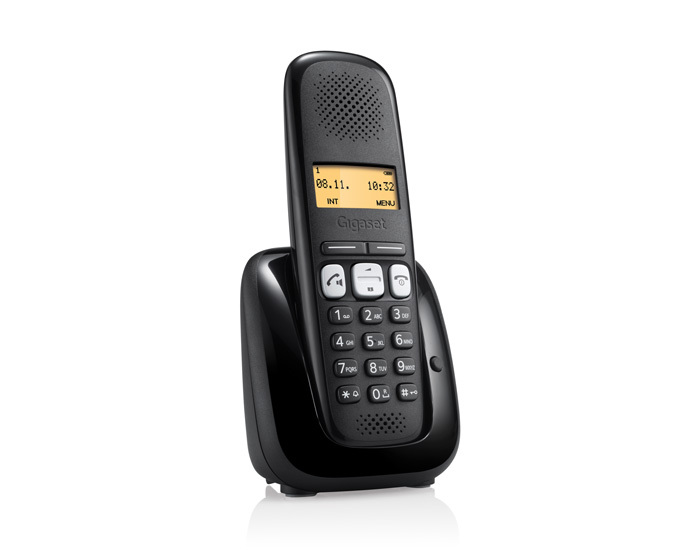 The Gigaset A250 is designed to make calling as straightforward as possible. It is ready for use as soon as you take it home – simply plug & play. Dialling is a pleasure on the keys made with sensitive pressure points, and the illuminated, graphical display is easy to read and navigate. You can choose to talk handsfree at any point during a conversation. Simply press the easy-to-find, illuminated handsfree key to enjoy the flexibility of handsfree talking. With the long talk time of 18 hours, your conversations can last as long as you wish. You also have no need to worry about the battery life of the Gigaset A250, which boasts a long standby time of up to 200 hours. Take advantage of the Gigaset A250’s phonebook with up to 80 entries to keep your friends and family reachable within seconds. The call list with up to 35 entries logs the phone numbers of the 25 most recent incoming/missed calls and the 10 most recent outgoing calls. That way, you can continue conversations and return calls in just a few button clicks. The Gigaset A250 is a reliable device for the basic information you need throughout the day. Its caller ID function immediately informs you who is calling when the phone rings. The Gigaset A250 also indicates the date, call duration and features a convenient alarm function. The Gigaset A250A comes with a built-in answering machine for simple message recording and retrieval. It has a recording time of up to 25 minutes and can be operated either via the handset or remote control, allowing you to receive messages away from the base station within your household. 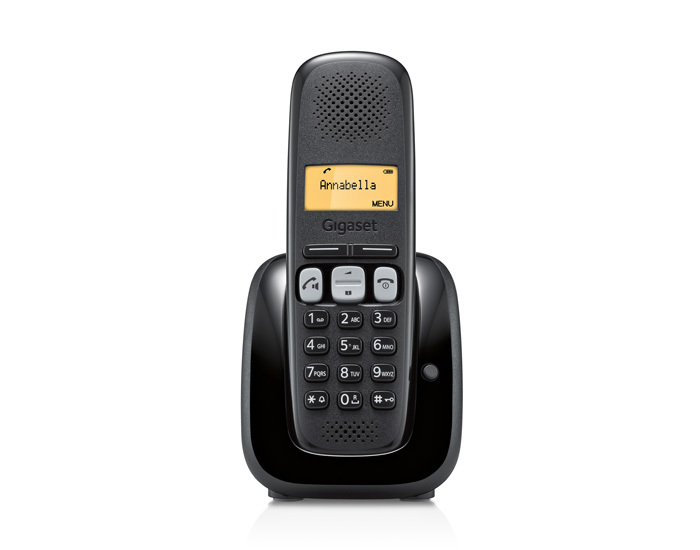 With the Gigaset A250A, you can choose either an automated message or record a personal greeting. The energy-saving power supply of the Gigaset A250 consumes less electricity, so it’s kinder to the environment, and kinder to your wallet. Like all Gigaset cordless phones, it variably reduces the transmitting power from the handset to base station depending on their distance apart. Furthermore, radiation-free ECO Mode Plus turns off the transmitting power when the phone is in standby. The Gigaset A250: the reliable phone with a long talk time and handsfree functionality.